Generous size clear, plastic texture sheet to create edible projects with outstanding details. 21" x 23". TO USE WITH FONDANT Roll fondant to desired thickness. Flip smooth rolled side on top of mat. Roll over the mat, one time. Lift mat and cover cake. TO USE WITH CHOCOLATE Spread melted candy coating or melted and tempered chocolate on sheet. (It is easiest if mat is cut height desired). Allow chocolate to "just set" and form sheet around cake. Place in refrigerator to set. TO USE WITH BUTTERCREAM Ice cake with buttercream and allow to set for several minutes. 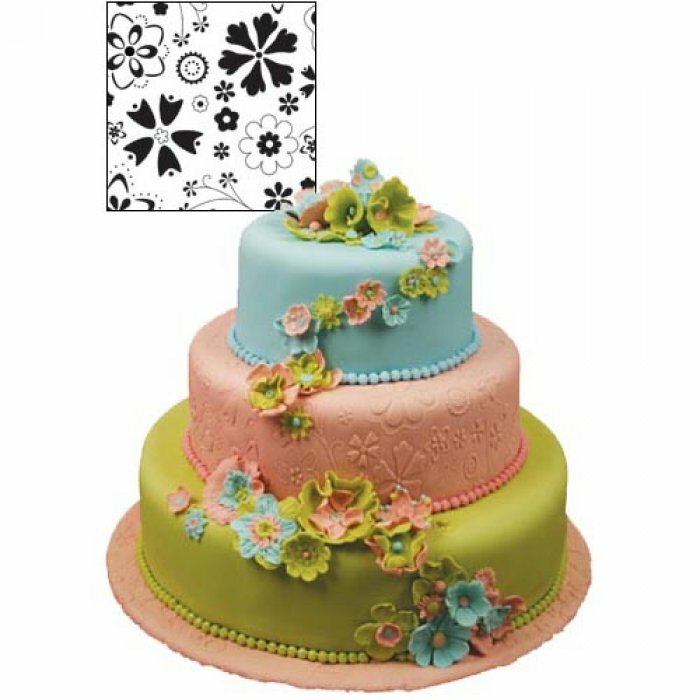 Place sheet on crusted buttercream and impress design. Specific instructions included with the sheet.